Some of you might know the story of Ava’s nickname “The Kraken” because you’ve seen her in action-she’s a force to be reckoned with, has been ever since she turned one and my sweet sweet baby turned into a feisty, stubborn, trouble-making little toddler, then girl. Rory was sending her to me one night after a bath way back when and yelled “releasing the Kraken!” and it kind of stuck! 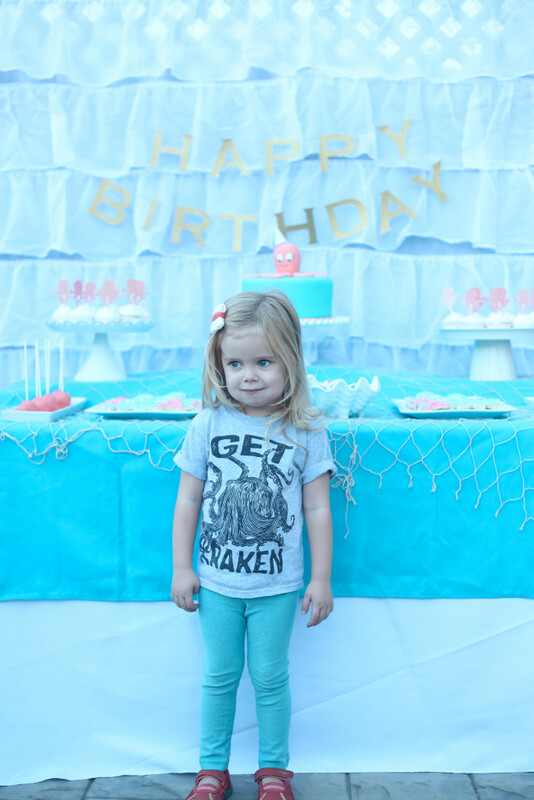 So we knew what her 3rd birthday party theme would be. DUH Krakens! 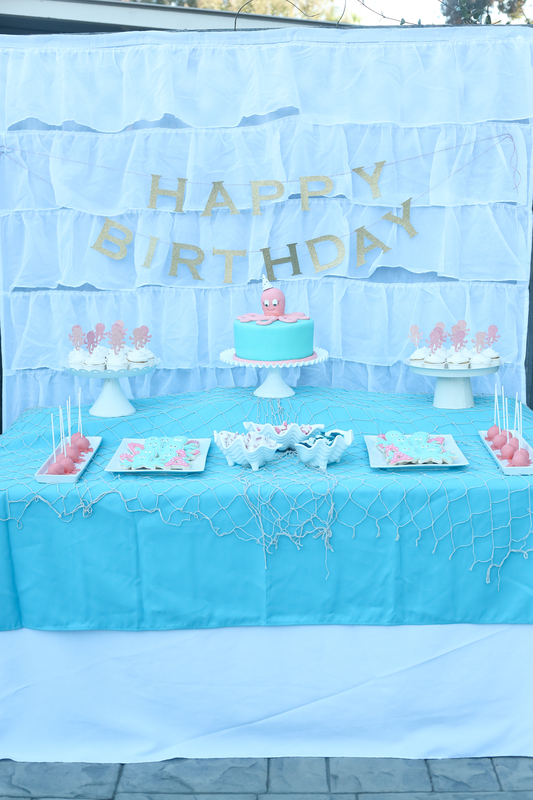 Besides the usual tablescape, I didn’t do much decorating because well, I was pregnant with Jack and NOT feeling much of the party fever! 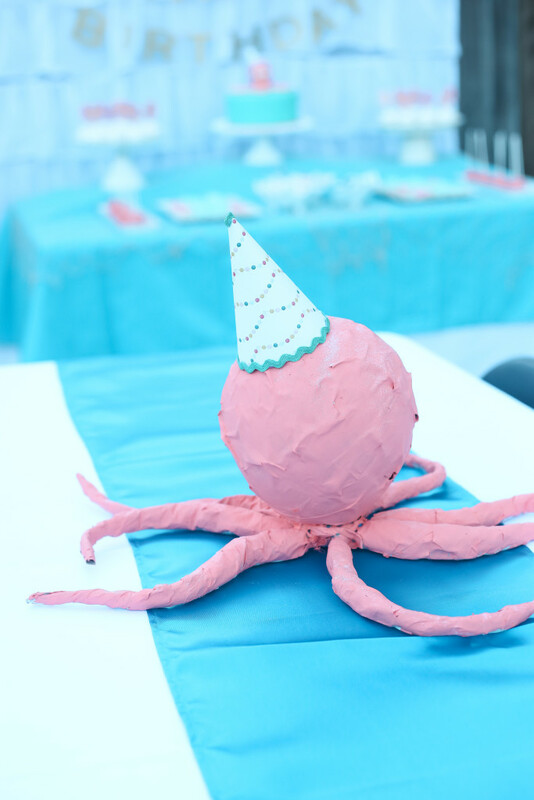 I did make some paper mache krakens to serve as centerpieces…these were more fun in concept then in reality, but once I added the party hat…I kinda loved em. 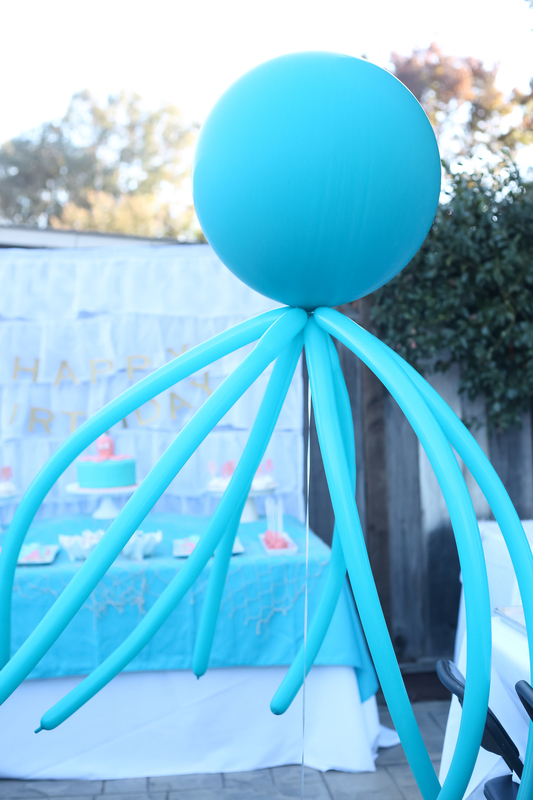 Made a couple krakens from large and skinny balloons-one ended up floating away mid-party and it was kinda hilarious seeing an octopus balloon meandering up into the sky. 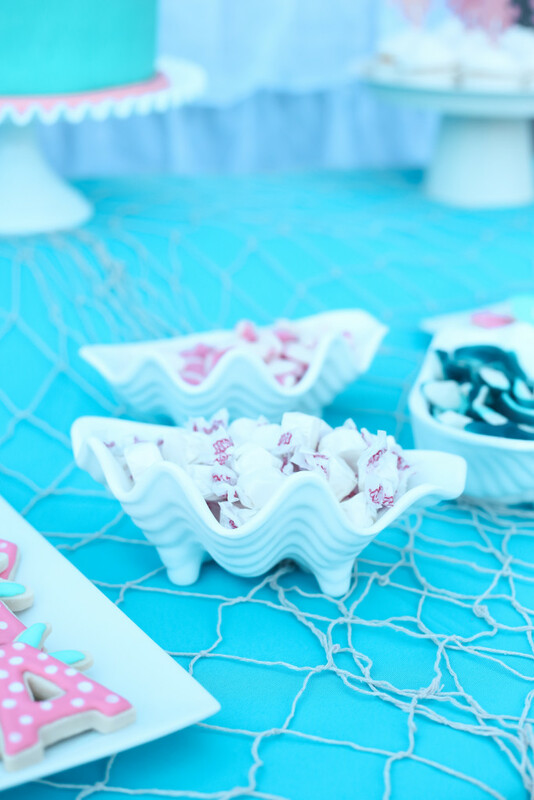 The table was pretty simple (for me), I had some nets and shell bowls left from Sadie’s Under the Sea party that for some reason I had kept…thankfully! Added a teal tablecloth and ruffled shower curtain backdrop from this shower, and the letters from her Deer party for a banner. Lots of recycling here! 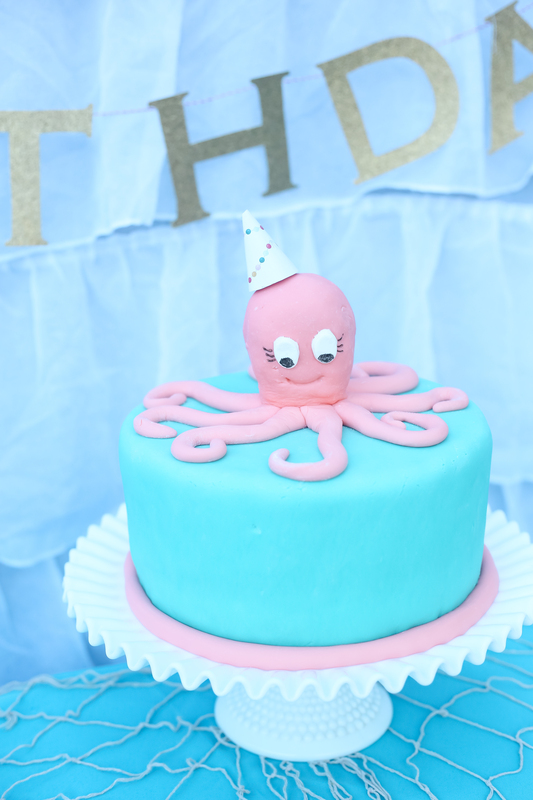 Her cake was really fun to make! 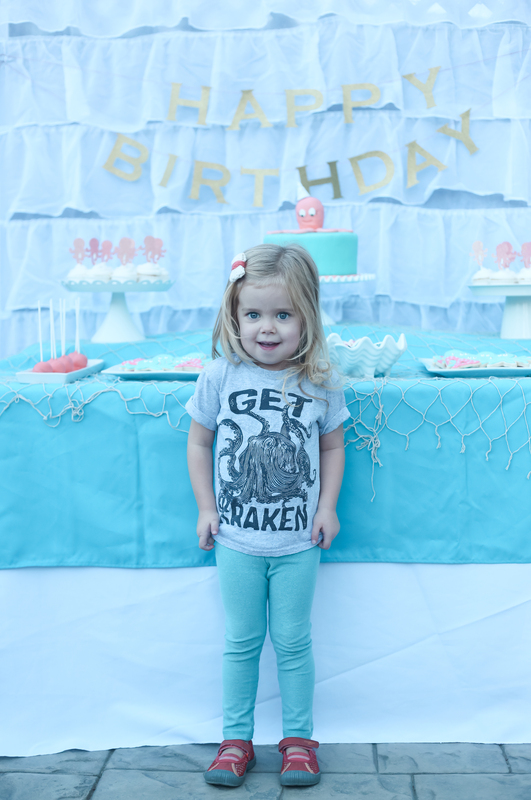 She loved watching the process-just a simple layered cake, which I covered in teal fondant and then created the little kraken topper! I used rice krispie treats pressed together in an oval shape for the head! Worked perfectly! Added a party hat because he’s a PARTY kraken! 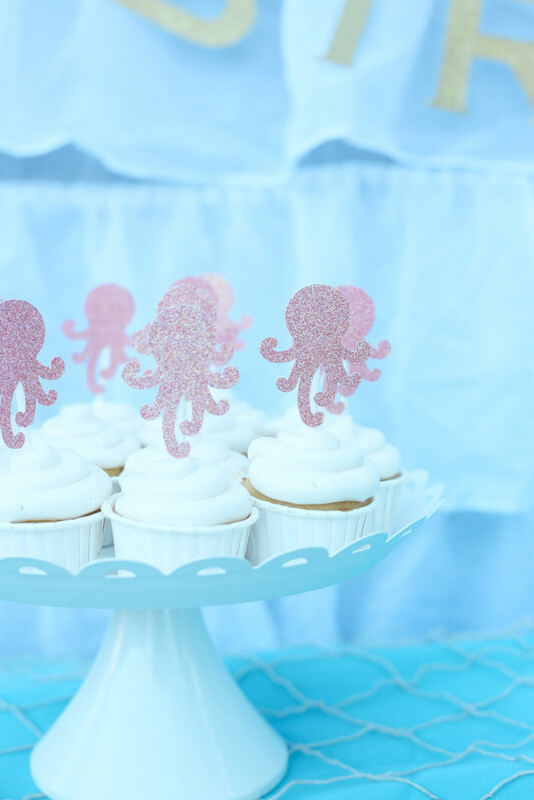 Simple cupcakes with little glitter krakens I cut out on my Silhouette, and glued to lollipop sticks. 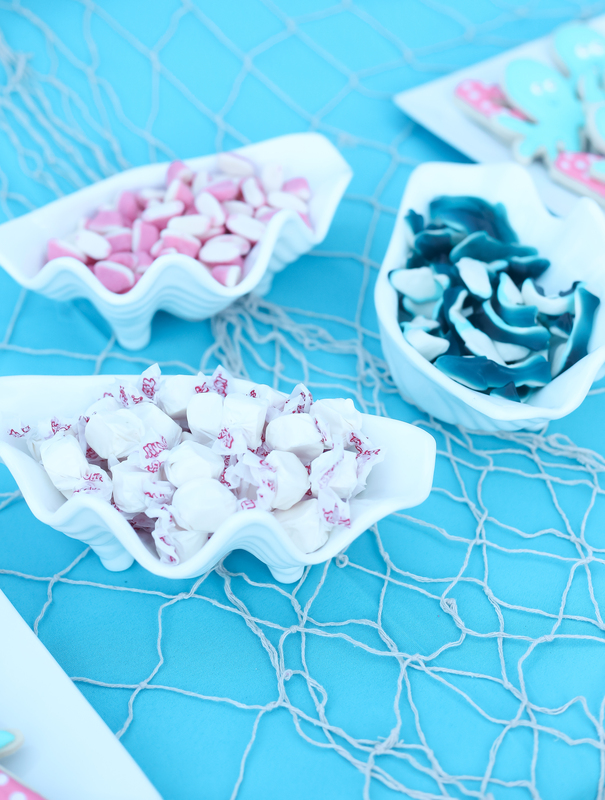 Served some delicious salt water taffy but of course, gummy sharks, and “sea anemone” candies in the shell bowls! 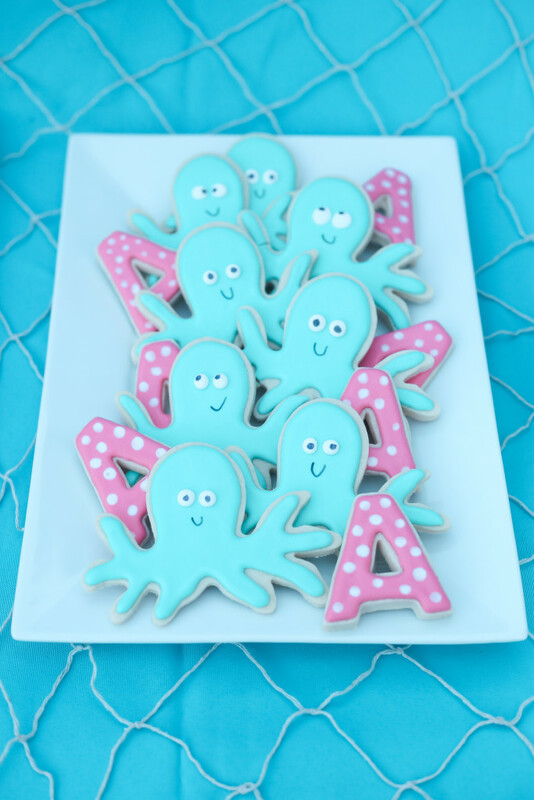 Simple kraken cookies and polka dot A’s for Miss Ava! 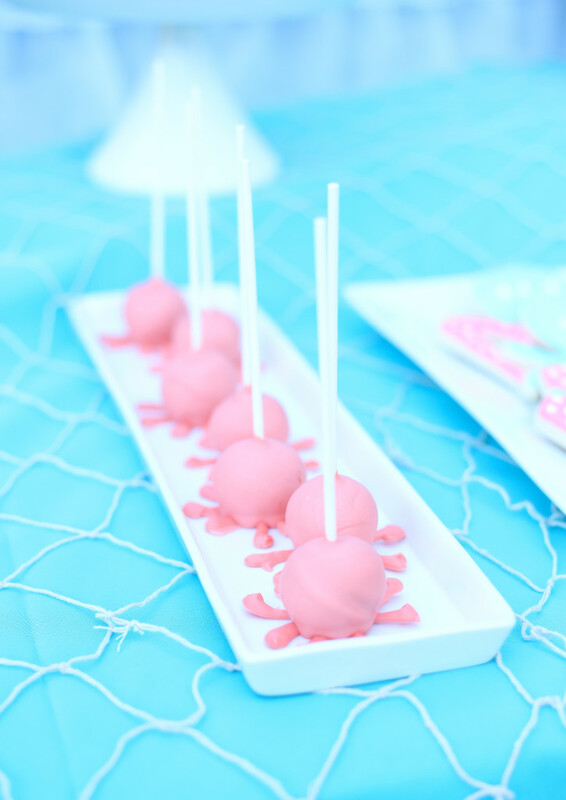 Also some adorable kraken oreo truffle pops! 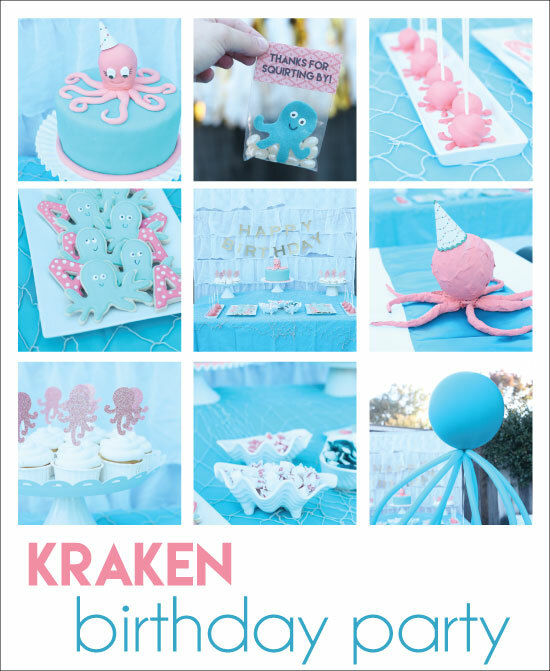 It turned out to be super fun and our little kraken loved it! I made some felt finger puppets for the kiddos and added some “bubbles” aka jelly bellies! Such a cute little kraken! Love the cake topper and the favors! 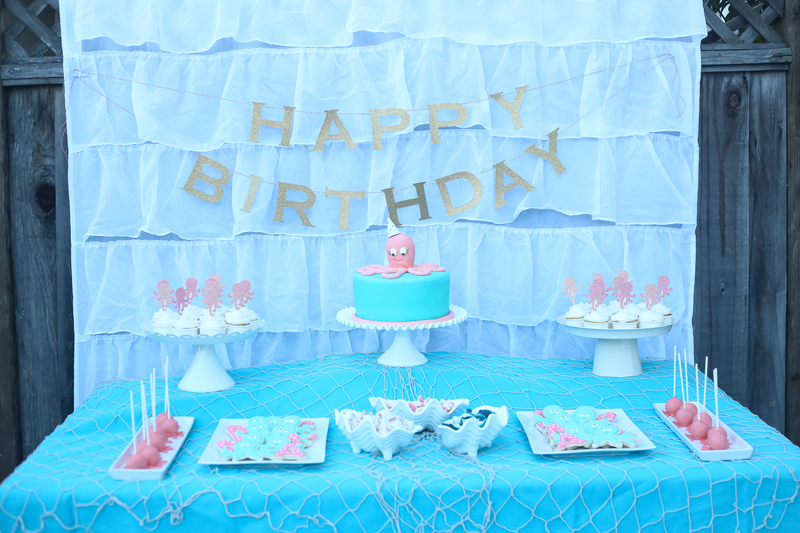 Your parties are always adorable! Thanks for sharing! That is such a fun party! Those paper-mache centerpieces are great! 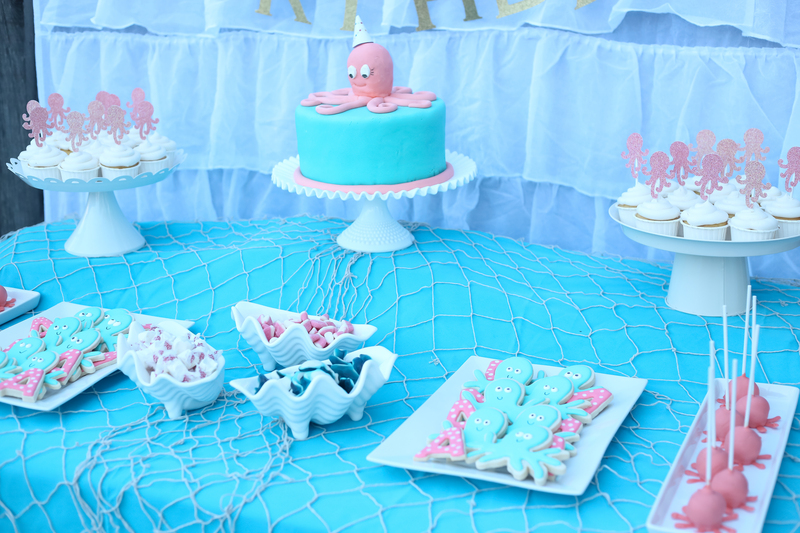 I love the kraken on the cake… and I like the idea to use rice-krispie treats for the base of shapes like that! Such a cute party! I love the Kraken origin story, so funny. Happy birthday, Ava!!! I know I’m a bit late with this comment (but to be fair I just recently discovered your blog haha!) 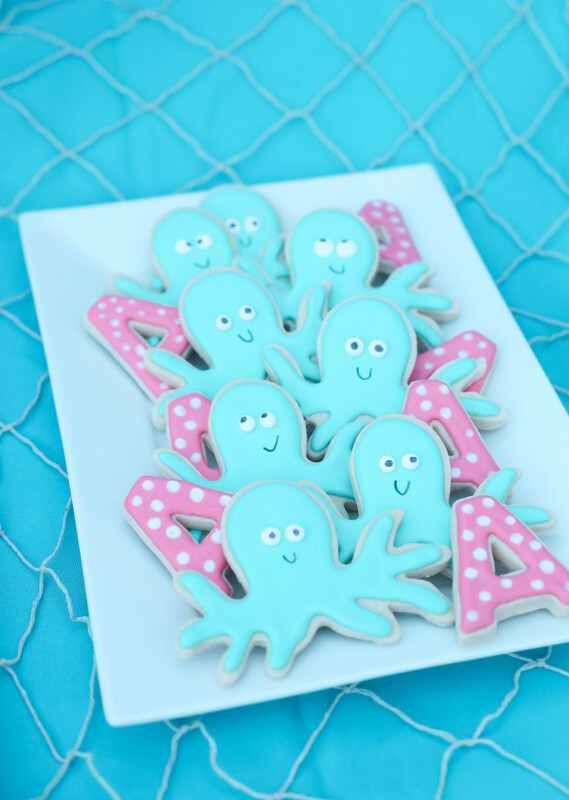 but this party is too darn cute! Love it AND the adorable nickname! thank you!! I appreciate that so much!